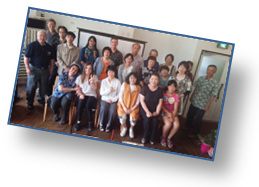 The Yurihama International Friendship Association (YIFA) hosted its Multi-Cultural Exchange Festival last month. Participants had the opportunity to take part in a Vietnamese cooking class, enjoy Jamaican music and dancing as well as English children’s books and conversation games in the English corner, try Hungarian sweets, Cuban coffee, Chinese teas, etc., as well as enjoy Japanese traditional performing arts, matcha green tea, and more. Thank you to everyone who came out and we hope to see you at the next YIFA event! 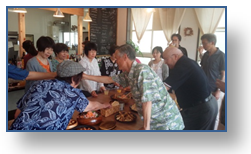 The Yurihama International Friendship Association (YIFA) hosted an international understanding lecture and exchange event at Café Achelino on June 12th, 2016. Guest lecturer Steve O’Brien, who has been involved with Cuba’s Radio Havana Cuba for several years, spoke about Cuba’s relatively unknown but strong education and health care systems, economy, history, politics, and more. Participants then enjoyed a question and answer session over a sample of delicious Cuban coffee following the lecture. The latter half of the event consisted of an exchange event where participants chatted as they enjoyed the various dishes prepared by Café Achelino and both created new friendships while strengthening the old.